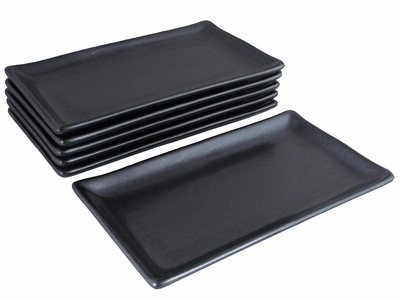 Part of the Black Alloy Collection, this Asian plates set comes with six unique rectangular sushi plates ideal for serving your signature sushi roll creations, appetizers, salad, or dessert in style. In a stylish and bold black, this Asian plates set has a modern aesthetics complemented by the rectangular shape of the plates in the set. Featuring a smooth finish with a soft sheen, this Asian plates set makes a unique and striking addition to any dining table. Microwave and dishwasher safe, this Asian plates set is fun, unique and elegant and makes for a versatile addition that will complement a wide variety of dining ware. Made in Japan and crafted from ceramic, this Asian plates set comes packaged in a paper box for protection.